Once again the Asia-Pacific region was pushed to the brink of war as North and South Korea became locked in –and then finally averted – a tense military face-off. With nuclear-armed North Korea declaring a quasi-state of war last weekend and the United States ally of South Korea reportedly preparing to move “strategic assets” – code for nuclear weapons – into the peninsula, the risk of escalation was all-too grim. In the end, nearly four days of marathon talks between senior North and South Korean officials managed to pullback from going to war. Pyongyang relented by issuing a public statement of “regret” over a land mine incident earlier this month which seriously wounded two South Korean soldiers along the Demilitarised Zone (DMZ) dividing the two states. 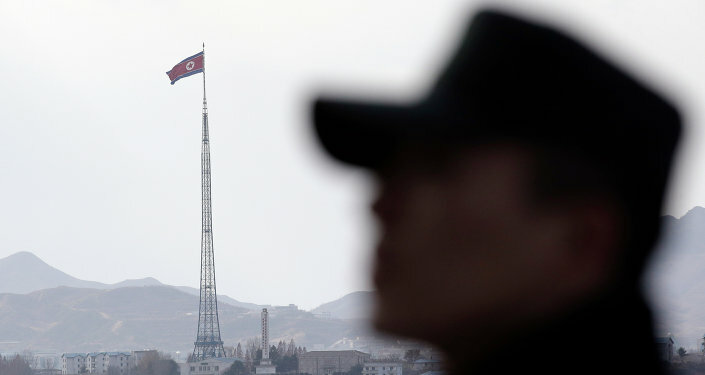 For its part, the South Korean government in Seoul agreed to turn off loudspeakers pumping out high-decibel propaganda into North Korea. The trouble, however, is that both Koreas are unlikely to develop this potential for rapprochement. This is because of the malign background influence of the United States, which has nearly 30,000 troops stationed in South Korea. The decades-long US military presence is a legacy of the 1950-53 Korean War during which America backed the South against the Communist North. Washington continues to insist that its military forces on the Korean Peninsula are there in order to “protect” its Southern ally from Northern aggression. Washington’s apparent chivalry is really all about giving itself a legal, political justification for basing its military power in a strategically important region, thousands of miles from American shores. The use of the “protection claim” is a well-worn ploy invoked by sundry colonial suzerains down through the centuries, as well as by organised crime syndicates. Let’s cut to the chase. Every year when the United States conducts its military “war games” with South Korea the occasion invariably incites explosive tensions on the Peninsula. North Korea, which for decades has been enduring heavy economic sanctions imposed by the US, views the annual military manoeuvres as a provocation. Understandably, too, because the joint American exercises involve rehearsal of land invasions as well as aerial bombing runs. Given that North Korea suffered immensely during the Korean War from saturation American carpet-bombing, killing millions of its people, the mere staging of similar military actions are bound to be seen as offensive. This is especially so because the 1950-53 Korea War is still technically ongoing since a full peace settlement was never declared. The Peninsula is really in a long-term truce from hostilities – hostilities that evidently erupt on a recurring basis. Last year, when the two Koreas negotiated a breakthrough goodwill initiative allowing reunification of families separated by wartime partition, there were high hopes for historic reconciliation. There were emotional scenes as families from North and South embraced each other after spending decades apart. The tearful, joyful occasion seemed to be an allegory for the entire Korean nation. Nevertheless, that tentative reconciliation was quickly blown away within weeks, when the next round of annual US-South Korea military manoeuvres took place. Official rhetoric returned to sabre-rattling and recriminations between Pyongyang and Seoul – with Washington as usual proclaiming that it would “defend” its ally if all-out hostilities manifested. As with the latest accord between the two Koreas to de-escalate tensions and to pursue wider mutual interests, it is a safe bet that this initiative will likewise come unstuck sometime in the near future, owing to Washington’s huge military presence and projection of war. It is significant that hot on the heels of the North-South dialogue last week, South Korea’s foreign minister was summoned to meet US Secretary of State John Kerry in Alaska, according to the South Korean news agency Yonhap. One wonders who is briefing who in this urgent meeting. The thorny problem of Korea’s elusive rapprochement has to be seen in a bigger regional context. Since 2011, the US Obama administration has dramatically ramped up military forces in the Asia-Pacific under its “pivot to Asia” policy. The United States has greatly increased its deployment of troops, warships, warplanes and missiles in conjunction with a web of allies among Australia, Japan, the Philippines, South Korea, Taiwan and, perhaps surprisingly, Vietnam. The United States may not refer explicitly to China as an “enemy” but it is obvious that Beijing is the object of America’s expanding militarism in the region. Just this week, commander of the US Pacific Fleet, Admiral Harry Harris, was in Manila to expand deployment of American military forces along with the Philippines in the South China Sea. “Philippines Seeks US Help to Protect Troops in Disputed Sea,” was how Voice of America reported the high-level meeting with Filipino President Benigno Aquino. Note again the operative word “protect”. Washington’s truculent interpolation in competing territorial claims has seen it ratchet up warnings to China over land reclamation projects, while at the same time giving its military backing to the various other regional countries. US Defence Secretary Ashton Carter earlier this year warned that any attempt by Beijing to contest Japanese claims on the Senkaku/Diaoyu islets in the East China Sea would be viewed as an assault on American interests owing to the newly revised military pact between Tokyo and Washington. Washington also asserts that its military forces are “safeguarding right to passage” for cargo ships through the South China Sea and that this then justifies sending American aircraft and warships into Chinese territorial waters. This is despite the fact that China has not impeded any trade traffic through these waters. It is well documented that the Asia-Pacific has vast marine resources of natural gas and oil. To this end, the United States is compelled to exert its dominance over the strategic region, and in particular to try to contain China as a rising global power. By fanning claims of Chinese aggression and expansionism, Washington seeks to incite tensions, which in turn permit it to militarise the region. A peaceful resolution to Korea’s Cold War syndrome is long overdue and deserved by its people, North and South. American military withdrawal and disarmament is the logical conclusion to facilitate this outcome. Washington, of course, will not embark on such a disarmament because of the imperative geopolitical reasons outlined. It is up to the American people to educate themselves on the real impacts of their government and its military, and then to demand withdrawal of all US forces from not only Korea, but the entire Asia-Pacific region. The world should not be subjected to the appalling recurring risk of war just because the American ruling elite and their industrial-military complex want and need it in order to exert their strategic ambitions. Uncle Sam needs to pack his bags and go home. Then peace in Asia might prevail.